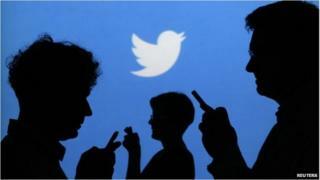 On Thursday, Twitter begins its first day of trading after listing on the New York Stock Exchange, making it the biggest initial public offering (IPO) from a technology company since Facebook went public in May 2012. The giant micro-blogging site, founded just seven years ago, is worth more than $18bn. Days ahead of the flotation, amid heavy investor demand, the micro-blogging firm raised its share price range by 25%, and they were eventually priced at $26 per share. Twitter may have about 232 million monthly users, but the company is not profitable - yet. So, how does Twitter make its money and how can we explain its high valuation? But analysts say the company is showing strong signs of growth, with revenue rising from just $28m in 2010 to $317m by the end of 2012. One research firm, eMarketer, estimates that Twitter's revenues from advertising sales will increase by more than 100% by the end of this year. Almost all of Twitter's revenue - about 85% of it - comes from advertising on its site. There are three main ways for a company or an individual to advertise on Twitter: by promoting a tweet that will appear in people's timelines, promoting a whole account, or promoting a trend. Only last week Twitter changed the way posts are displayed in the timeline feed, allowing photos and video previews to appear without needing to click on a link - a move some analysts say will help advertisers to better show off their content. Twitter tends to charge its advertisers according to the amount of interaction their content generates. A budget is usually set at the start of the campaign and then the advertiser pays per click or per retweet. It also has a "bidding" system in which advertisers compete with each other to have their content appear in a particular space. "One of the advantages of Twitter for marketers over traditional display advertising is they have worked really hard to make sure that advertising on Twitter is not interruptive," says Lara O'Reilly, senior reporter at Marketing Week. Anything that disrupts the user experience might reduce engagement from users, which in turn can put off advertisers, Ms O'Reilly says. "It's not a flashy banner that gets in the way of something. It looks very native," she explains. Also, the company takes in a significant portion of its advertising revenue from mobile devices - in contrast with Facebook, which had not fully developed its mobile strategy at the time of its listing. As of 2013, more than 65% of Twitter's advertising revenue was generated from mobile devices. More than 75% of Twitter users accessed the site from their mobile phone during that same time period. "Because Twitter was born as a mobile platform they already have this part sorted," Ms O'Reilly adds. "In investors' eyes, they have a mobile strategy." Data licensing is Twitter's second major revenue stream. The micro-blogger sells something known as the "firehose", its public data, which often adds up to about 500 million tweets each day. Companies can dive deep into the data to analyse consumer trends and sell their insight on to other brands and companies. Because the tweets are public, consumers also have access to this data. But Nick Halstead, founder of DataSift, one of the only two companies with access to the firehose, says that with sophisticated analysis companies can learn detailed and specific information about their users that, because of the volume of data, an ordinary user or company would not be able to get. Firms could use the data to do simple things, he says, like monitoring sentiment towards their brand or product. But the data can also be used in a much more complex way. "One of my favourites is around stock levels," Mr Halstead says. "For example, in the US football teams will analyse the popularity of players by region to work out how much they should buy of a particular football top to stock them in shops." He adds: "In the UK we all rush out and buy barbecue equipment on particular weekends, and supermarkets want to stock up when that happens, but they need three or four days to do that. "You can use Twitter for modelling when people are planning to hold those kind of events." While Twitter may have proved it has the potential to make money, analysts say there are still hurdles to profitability. The company is spending a lot of money investing in advertising technology and expanding its team, says Clark Fredericksen, vice president at eMarketer. And it plans to keep spending after going public. "We can expect that they will continue to make those investments because they're looking long-term," he says. But Mr Fredericksen adds Twitter needs to show it can monetise its international users and work with small businesses. "When Twitter goes to advertisers a big part of their pitch is using Twitter to work with other media," he says, adding that the site gets huge traction with users around events like the Oscars or episodes of popular television shows such as Breaking Bad. "Whether that formula will translate in smaller TV markets needs to be seen." Twitter: It's worth how much? !